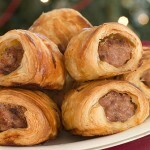 Pigs In A Blanket « Dayoub Marketing, Inc. Core the cabbage and place head-down in enough boiling water to cover. Turn off heat. When cabbage has softened, remove from water and separate leaves, leaving them whole. Trim heavy vein down to make it look flat. Combine meat, onion, egg, seasonings, and rice. Mix well. In the center of each cabbage leaf place 2 to 3 tablespoons of this filling mixture. Fold two sides down toward center and roll. Secure with toothpicks. Place in large kettle or Crockpot; spread sauerkraut over the rolls. Add the tomato juice and water. Bring to a boil on high heat; reduce heat and simmer for 1 1/2 hours. Please cabbage rolls on a serving dish. Mix a small amount of the liquid with the sour cream and pour over the cabbage rolls. This entry was posted on Thursday, May 27th, 2010 at 12:05 pm	and is filed under Recipes. You can follow any responses to this entry through the RSS 2.0 feed. Both comments and pings are currently closed. © 2019 Dayoub Marketing, Inc.